Lightweight upright carpet cleaners is a category including carpet cleaning machines of smaller size and weight perfect for effortless home carpet cleaning. While being small and light enough to be easily carried around the house, these home carpet cleaners are capable of great results in shampooing the carpets, picking up all kinds of dirt and removing stubborn pet stains. Usually, these machines are used for quick everyday cleaning of your home rooms and early removal of various stains and spills. To see the reviews of non-upright portable spot cleaners, go here. 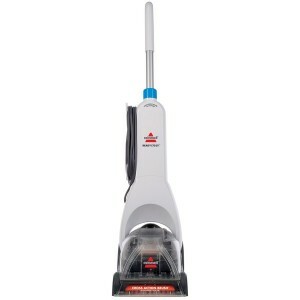 The Bissell ReadyClean PowerBrush 47B2 carpet cleaning machine is one of the new 2012 Bissell designs. It perfectly demonstrates the Bissell’s idea of an impeccable compact lightweight carpet cleaner: little in size, lightweight, highly usable, simple in storage. Its slim and compact design perfectly underlines its comparatively small weight – 13 lbs only. This small upright carpet cleaner can rightly be proud of not only its looks but also functions: it has a separate easy-fill tank for clean water. This feature makes the machine remarkably more usable, especially in comparison with other Bissell’s regular carpet cleaners equipped with a single adaptable “bladder” pouch for clean water. The key features to consider include DirtLifter PowerBrush technology, 0.5-gallon water tank, and a removable handle for more convenient storage. Undeniable usability and remarkable ease of storage make the Bissell ReadyClean PowerBrush 47B2 cleaner a very desirable choice. Unfortunately, there is one disadvantage. Thought this model performs the function of shampooing and cleaning the carpets quite well, its cleaning power is noticeably lower in comparison with regular-grade carpet cleaners. 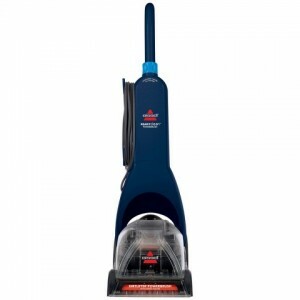 This Bissell 47B2 lightweight model will serve well in cases requiring quick and easy stain cleaning. While being a good choice for small rooms and limited areas, it should give way to more powerful professional cleaners when full-house carpet cleaning is needed. Still, Bissell 47B2 will be a great defender of your everyday carpet’s cleanness. It will enable you to keep your carpets in the perfect state without consuming too much of your time and energy. The Bissell ReadyClean 40N7 lightweight home carpet cleaner shares the features of Bissell ReadyClean 47B2 presented above, with the most noticeable difference in white color of the design instead of blue. Bissell ReadyClean 40N7 is also characterized by maneuverability, the small weight of 12 lbs, and easy storage owing to a removable handle. Just like its “counterpart”, Bissell ReadyClean 47B2, this lightweight carpet cleaner has a two-tank system, which is comprised one 0.5-gallon tank for clean water conveniently located on the rear side of the cleaner and one tank for dirty water positioned near the nozzle at the front of the machine. A comparatively compact dimensions of the Bissell ReadyClean 40N7 model does not impair its effectiveness in removing dirt and spots, including the more stubborn pet stains, from the carpet surface. In terms of the brush system, Bissell ReadyClean 40N7 loses ground a bit to the previously introduced Bissell ReadyClean PowerBrush 47B2. While the former operates on a stationary Cross Action brush technology, the latter is endowed with a more powerful DirtLifter system, which rotating brushroll provides improved carpet surface scrubbing. Nevertheless, we should admit that there is no drastic contrast between the cleaning results of two models. Essentially, Bissell ReadyClean Full Sized Carpet Cleaner 40N7 lightweight carpet cleaner is a great choice when you need quick and effortless clean-ups in small rooms or recently stained areas. This is explained by a rather good cleaning power of the machine in combination with its comparatively narrow cleaning path. While being perfect for everyday cleaning, these characteristics are not powerful enough for a major house carpet cleaning, where regular/professional grade carpet cleaners are a better option. For minor cleaning sessions, Bissell ReadyClean 40N7 is excellent. If you are looking for a lightweight home carpet cleaner that is close in its characteristics to regular-grade cleaners, Bissell PowerLifter PowerBrush Upright Deep Cleaner 1622 might be just what you need. This machine has a special place in the world of home carpet cleaners, on the border between lightweight and regular grade categories. 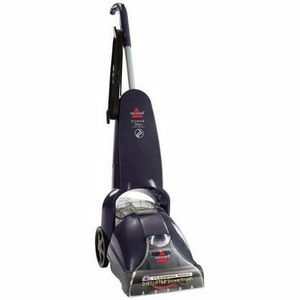 In comparison with the majority of lightweight models, this cleaner’s power indicators come very close to those of upscale regular-grade cleaners like Bissell Essential 8852. Although its 16.4-lbs weight and 19-inch depth slightly exceed the usual dimensions of lightweight machines, its design is still obviously slimmer than the one you get with regular-grade Bissell’s models, and this means higher ease of usage. When it comes to functional characteristics, this model also has features to show off: a bigger ¾-gallon water tank, a wider cleaning path of 11 inches , and the DirtLifter technology with four rows of brushes, which is used in upgraded Bissell’s models. The excellent cleaning effectiveness of this lightweight carpet cleaner is provided by not only these features but also by a comparatively powerful 6.25-amps motor, similar in amperage to the majority of regular-grade carpet cleaners produced by Bissell. Such a combination of characteristics has made Bissell PowerLifter PowerBrush 1622 effective enough to take up the role as the main carpet cleaner. It will be perfect for a small dwelling and require no additional purchase of a more powerful machine. From this viewpoint, this carpet cleaner stands out when compared to Bissell’s newer lightweight carpet cleaners, which were designed with bigger compactness and usability in mind, yet compromising on cleaning power. The new 2014 Hoover Power Path Deluxe Carpet Washer FH50951 machine is a light and slim model supplementing Hoover’s offering of deep cleaners for home use. It is characterized by the unique combination of small weight (13.4 pounds) and well-powered motor (6 amps). While having such a sleek profile, this lightweight cleaner can boast of an 11-inch cleaning path and ¾-gallon water tank, both of which allow covering larger areas than is usually expected of a lightweight model. The major comparative advantage of this model is the availability of an 8-foot hose and specialized hand tools. While the packaging of most lightweight models does not include these components, in the case of Hoover Power Path Deluxe, the user can enjoy the ability to solve a wider number of tasks and successfully clean soft furniture, crevice areas, and even car interiors. Other useful features of this lightweight cleaner list a system of two water tanks and dual spinning brushes. Hoover fans will undoubtedly love this lightweight carpet cleaning model. Still, we need to mention a number of reports on functioning failures, which is a bit higher than expected from a more recent model, especially in comparison with other Hoover home carpet cleaning machines. On the other hand, it is sometimes just a matter of chance when dealing with consumer-grade carpet cleaners. At the same time, there are numerous customer reviews observing great efficiency and high maneuverability of this machine. 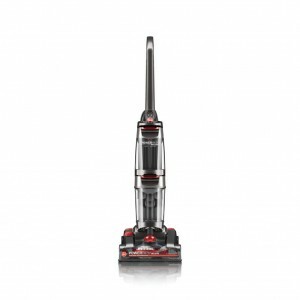 Taking into account higher power indicators and wider cleaning path, the Hoover Power Path Deluxe lightweight home cleaner can become the main carpet cleaner in a small house, just like the Bissell PowerLifter 1622. 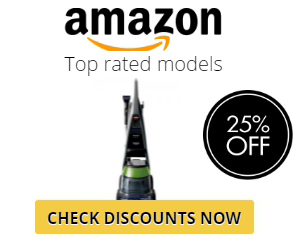 Of course, when compared to the powerful Hoover SteamVac with Clean Surge, this model will not demonstrate equal cleaning result, but it will cause considerably less trouble when carried around the house thanks to 7 lbs smaller weight. The Shark Sonic Duo Carpet and Hard Floor Cleaner ZZ550 is lightweight home cleaner designed for cleaning not only soft carpets but also hard floors. And its small weight of 9 pounds makes it probably the lightest machine capable of deep carpet cleaning. The design of this cleaner, which somewhat resembles steam mops, may let you think the machine can provide only surface cleaning. In reality, the Shark Sonic Duo lightweight carpet cleaner uses an intricate system of deep carpet cleaning. First, it picks up the particles of dirt and then uses the low moisture cleaning solution to get the rest of the dirt stuck deep among the carpet threads closer to the surface. After that, the dirt is gathered by vacuum cleaning. In terms of its cleaning efficiency, this lightweight carpet cleaner shows good results on both plush and berber carpets, although it cannot reach the same level of result as the deep cleaning models running on the water extraction technologies (like those described above). Nevertheless, this machine can be a good choice for quick everyday carpet cleaning and even for removing various kinds of difficult stains including pet stains, as reported in many customer reviews. 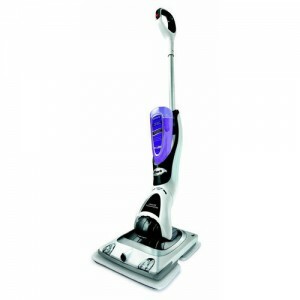 The Shark Sonic Duo Carpet and Hard Floor Cleaner ZZ550 model will most probably please those buyers who need an especially light and usable machine for cleaning not only carpets but also hard floor surfaces. The price tag of this machine is somewhat higher when compared to its competitors in the same “weight category”. In turn, this model offers effortless refreshment for your carpets until a major cleaning is needed.